Are there any restriction such as medical conditions, age or weight? The minimum age is 16. Anyone under 18 must have parental consent. For tandem skydives, there is no upper age limit. For solo jump courses, the maximum age is 54. People aged 55 years or over cannot participate in solo parachute training, but can participate in tandem skydives. People who have suffered from any of the medical conditions listed on the relevant declaration form, must be certified as fit to skydive and have a BPA form signed by their GP. See our Map & Directions page for info on getting to us! All specialist equipment such as helmet, goggles and jumpsuit will be provided. Goggles will fit over glasses and contact lenses are fine. Please wrap up warm, on a hot day t-shirt and trousers/shorts are fine, please wear good fitting trainers. High Heels are not suitable for skydiving! We have a small café, serving hot & cold food, however we only accept cash. Toilets are also on site which includes a disabled toilet. We also have a shower block, for your use. When can you jump ? Generally speaking the weather conditions have to be pretty good.This means only little cloud, because it’s important you can see the ground beneath you so that you know where you are in the sky and light winds so that your parachute can manoeuvre easily. When will I jump ? Unfortunately, we are unable to give you a time for your jump. The time which is given on your booking form, is your arrival time, not your jump time. Jump times are dependant on weather, demand and operational procedures. Can I use my own Camera / Go-Pro ? Sorry no, the BPA rules do not allow anyone to wear any camera equipment, either on the skydivers helmet or anywhere else, until you have undertaken 200 skydives. The average skydiver falls at somewhere between 110 and 130 miles per hour in the “standard” belly to earth position. It takes very roughly 10 seconds to fall the first 1,000 feet and then about 5 seconds for every subsequent 1,000 feet – so if an experienced skydiver falls for about 10,000 feet before deploying their parachute they will have had roughly 60 seconds of freefall. Different people fall at slightly different rates because different sizes and shapes of people create more or less air-resistance. As you fall through the air you create air-resistance and have air passing around your body at high speeds. This is referred to in the sport as the “relative wind”. As you become a more experienced skydiver you will learn how to alter your fall rate by making changes to your body position. By altering your body position you affect your air resistance and subsequently the rate at which you fall. It is a common MYTH that all objects fall at the same rate, this rule only applies in an absolute vacuum, where there is no resistance – here on earth we have air! It feels how you might imagine flying to feel or floating on a cushion of air, there is no “falling” or “roller-coaster” sensation. It is however quite noisy and naturally very windy as the air comes past you at great speed. Freefall is a really magical feeling that most people enjoy immensely and many people find highly addictive. Ever seen Superman flying across the sky in the movies? Well, freefall is probably the closest you are going to get. Try putting your arm out of a car window and feeling the sensation of your arm being held by the wind, your whole body will feel like that in the air. There are hundreds of reasons why people choose to skydive and whilst certain parts of the sport probably appeal universally to its participants, for example the basic feeling of freefall, but ultimately the reason why skydivers skydive tends to be quite personal. All are reasons why people skydive. In addition, the “scene” is extremely friendly, it is an incredibly social sport and a great way to meet interesting people. Skydiving is a sport with a number of different progression paths from the moment you are qualified, you can be assured that there will always be something to keep you interested in the sport and new skills to learn. There are approximately 5,000 active skydivers in the UK from a wide range of social backgrounds, there is a hugely rich social scene associated with the sport, which presents its participants with many opportunities to make friends and travel. Whats the difference between a skydive and a parachute jump? Skydives are by definition parachute jumps, that is because at the end of each skydive a parachute is used to land back on earth. However, where someone leaves an aircraft and immediately deploys their parachute without any freefall, it’s debatable whether that is technically a skydive but it’s definitely a parachute jump. In any case, there is no need to get strung up over terminology everyone at a drop zone (what skydivers call a skydiving centre) will understand what you mean if you use either term. A skydive is the name given to the act of leaving an aircraft at altitude and falling for a short while before opening a parachute and returning to earth. That falling or “freefall” as it’s known is what defines it as a skydive. Enjoyed by hundreds of thousands of people around the world, Skydiving is not a stunt, it’s a skilled sport that offers almost an unlimited progression path for those that would want it. It is also a highly sociable sport with a wide range of different participants. Why not have a look at our gallery to see what our regular skydivers have been up to. Although skydiving is seen as a high risk sport when compared to say, snooker or football, It is not anywhere near as risky as many people would believe. Our modern parachute systems and teaching methods are extremely reliable. 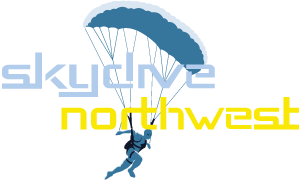 Skydive North West has a great safety record. Safety is our top priority here at Skydive North West, we pride ourselves on our training and the maintenance of our equipment – including our fantastic aircraft the PAC 750 XL – the only purpose built skydiving aircraft in the UK. All Skydiving equipment has a number of safety devices, firstly you have a reserve parachute, so if in the unlikely event there is a problem with the main parachute, you have a spare. In addition to that, all parachuting systems in the UK are equipped with an Automatic Activation Device. This is a special piece of equipment that automatically deploys your parachute for you if necessary. Modern parachutes are highly manoeuvrable; you can steer and fly them in whatever direction you like and with a bit of practice you will be able to land your parachute with a great deal of accuracy. At landing time it self you can momentary slow the descent of the parachute using a maneuver called a flare to give you an easy, soft stand-up landing. Long gone are the days of high-malfunction rates, modern parachutes are incredibly well designed and rigorously tested. However, in the rare event of a malfunction all skydivers have a secondary reserve parachute that they can deploy and fly to the ground in exactly the same way as their main parachute. The more you skydive the less scary it becomes and in fact after a few jumps what started off as fear, will probably become nervous apprehension and then nervous excitement! There is no doubt that some people find learning to skydive stressful. In fact most people, especially on their first few jumps find that they are scared to some extent and this is completely normal. However, most Skydivers find that their fears quickly subside after a few jumps and that instead of being scary – it becomes exciting, addictive and appealing on many different levels. With skydiving the old saying ‘there is nothing to fear but fear itself’ has some merit. The fact is people wouldn’t continue to skydive and take it up as their main pastime and hobby if it was that scary. It’s perfectly normal to feel apprehensive about skydiving even if you are considering learning. You will almost certainly have not been exposed to anything like it in your life and like anything completely new, the idea will of course feel strange. If you feel nervous, practically everyone you speak to in skydiving will know what you’re going through and sympathize with you. Are all skydivers risk junkies? People skydive for a number of different reasons but by and large most skydivers are just regular people. Skydivers come from a wide variety of different backgrounds and have a number of different ‘day jobs’. Many skydivers are professional people with highly responsible vocations, many are parents and grandparents. Skydiving can appear costly, however the cost drops dramatically after your first solo jump and it is worth every penny. A Tandem at £230/ Solo £ 190 the choice is yours! Following the completion of your first solo training jump the price drops to £32 a jump until you reach the end of your qualification at roughly 18-30 jumps. Once qualified the price sounds even better at £21 a jump or you could even book yourself a block of ten at £180. This would make it £18 for moments of wonderful madness. There are a lot of things you will need to learn and learn well, you can do this and progress quicker than you think but it requires an element of “steel”, alertness and common sense. But don’t worry you certainly don’t need to be a rocket scientist,there are skydivers from every walk of life, from all sorts of different professions and with a wide range of academic ability. There is always something new to learn in skydiving. Amongst many other things your solo skydiving course will teach you to fall “belly to earth” in a stable position and perform turns, but you can refine these skills to enable to to fly very close to other skydivers, around them, towards them, over them and under them – with phenomenal control and precision! There are hundreds of freefall disciplines to develop and wide range of canopy skills to learn and refine. Many skydivers with thousands of skydives will say there’s still lots of new “stuff” for them to learn and this, in part is why skydiving is such an addictive amazing sport. The best in the sport often choose to compete in their chosen discipline against other at any of the hundreds of events around the world each year. Have a look at our gallery to see what our regular jumpers have been up to lately. All students wishing to progress in their chosen discipline be it FS1 FF1 will only have to pay £40 per ticked this covers the cost of your instructor jumping with you and is cheaper than paying the old method of their ticket. We hope this will reduce the cost of training you guys to be able to fly with each other and hope to progress our students to be where they want to be with the Sport.